Captain George Thomas was a WW II fighter pilot, and had just returned from a combat tour, flying F-80s in Korea. His decorations included two Distinguished Flying Crosses. Just before takeoff, he had problems with the headset in his helmet, so a ground crewman got another helmet and oxygen mask from personal equipment to replace his own. He joined the other two ships in his flight for camera gunnery practice. The flight leader broke off and became the target ship. As Thomas came in on a "curve of pursuit" designed to give maximum "gun time" against a bomber and squeezed the trigger he heard a rumbling that he took for his guns actually firing! He broke off and told his wing man about it. His wingman suggested that he check his cockpit pressurization compressor. When Captain Thomas turned the compressor off, the problem went away. Shortly thereafter, Thomas began showing signs of hypoxia. He could not see the target ship, even though he nearly collided with it and his speech was slurred and disoriented. His flight mates made repeated calls for him to go to 100% oxygen, but he entered a gradual climb, leading to a stall and steep power dive. 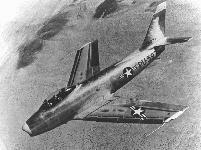 The aircraft struck a ridge, nearly straight down, at or above Mach 1, killing the pilot instantly. The inquiry concluded that the "strange" oxygen mask fit poorly or possibly the oxygen hose had come detached from its socket. 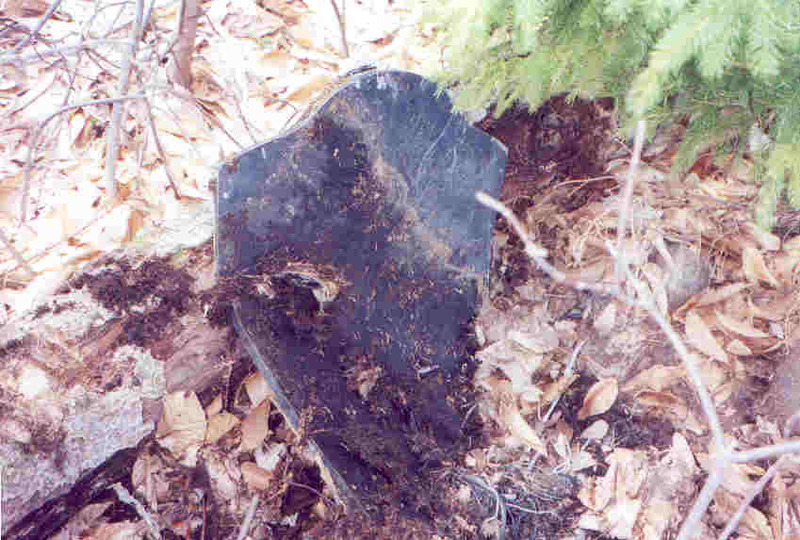 FOR MORE PHOTOS OF THIS CRASH SITE THEN AND NOW, AS WELL AS THE USAF REPORT SUMMARY, FOLLOW THIS LINK TO CRAIG FULLER'S AAIR SITE PAGE ON THIS CRASH. 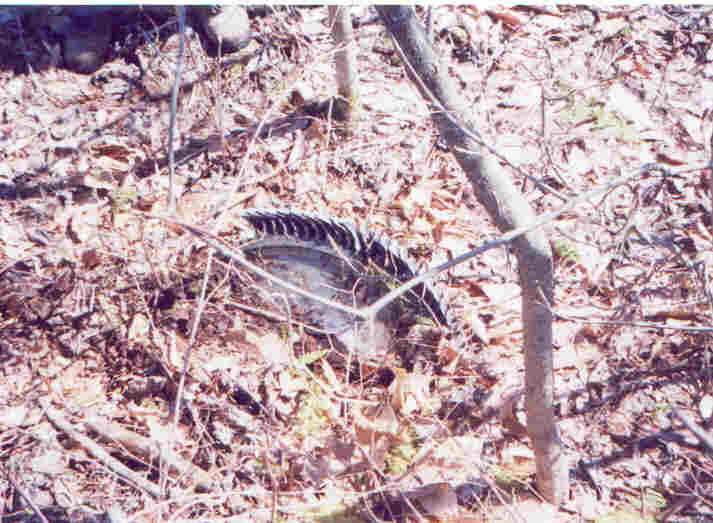 A piece of engine turbine wheel embedded in the ground 100 yards downhill from the crater. 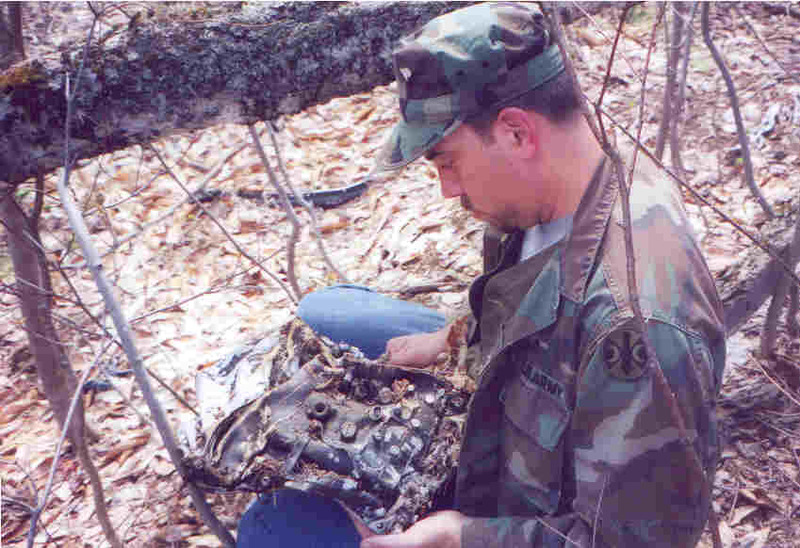 Mike Cornet holds part of an ammunition chute during a 2001 MAHS public crash site hike. Cockpit section with the aviation archaeologist's "holy grail"- the aircraft's specification plate. 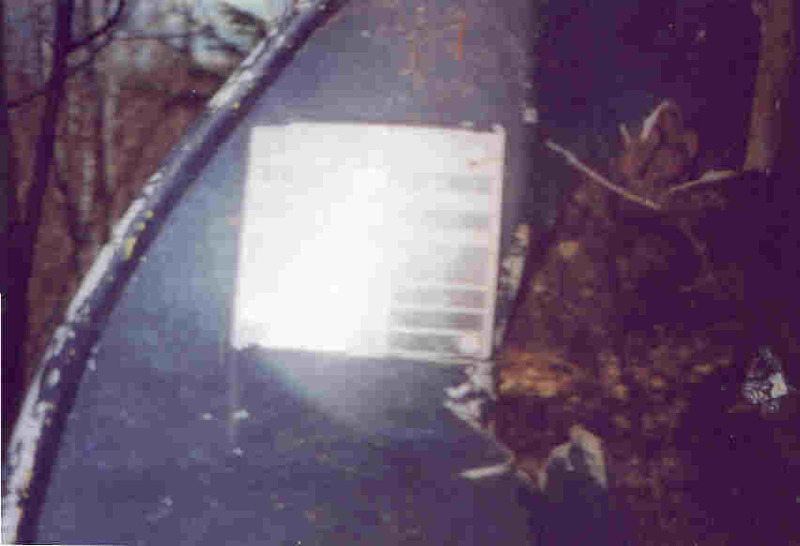 Section of the nose skin with the gun camera port visible at the top. 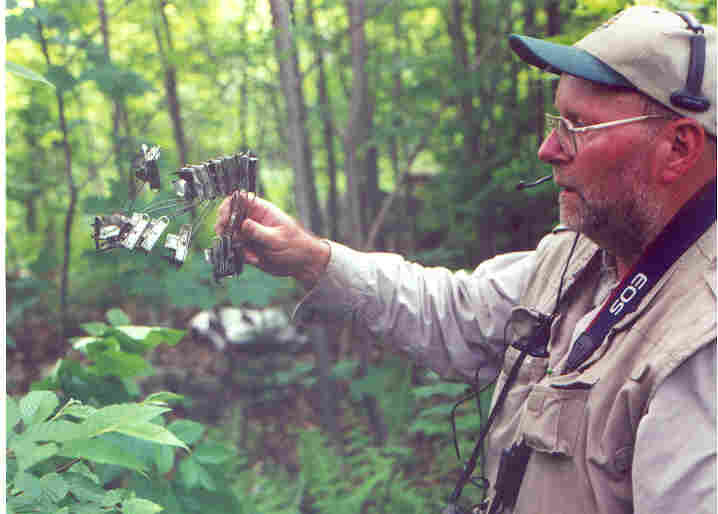 Howie Noddin holds the cockpit IFF transponder unit. 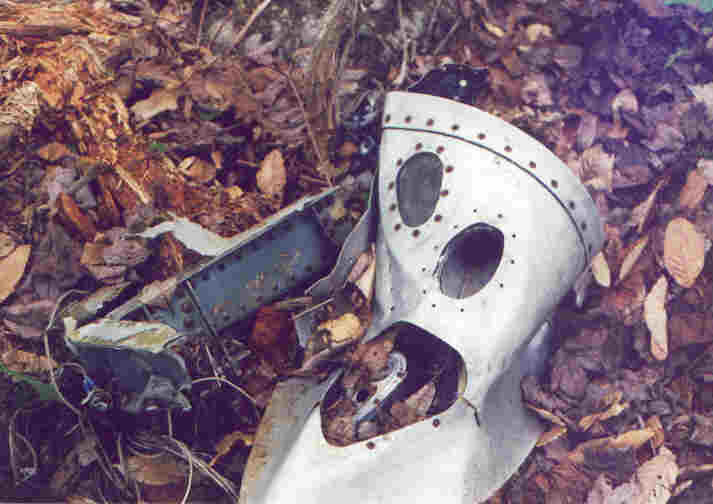 The armor plate from the rear of the cockpit.